Big news yesterday!! Jose Maurinho has finally left Chelsea after a few great reports saying dat he's gonna stay with Chelsea for a looooong period of time. 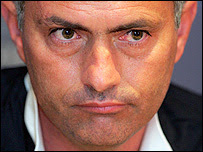 I was really shocked when I received an sms from Kerol saying Jose Maurinho has quit! 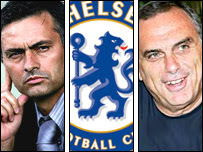 His position now is being replaced by Avram Grant, Chelsea's director of football. "...I'm ze manager and when I say I dont want anybody to intefere wit my coaching duty... I mean it!! so.. dont ever trY!!!.... " "..... Muah kah kah kah.... 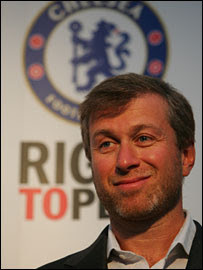 I'm ze Boss and when I say I want to win trophies, I'll do whatever necessary to win it... and that includes sacking u!!! muahahaha... "
I still dont understand why Jose quits Chelsea but some reports state that he has problems wit the owner, Roman Abramovic, the Avram person and also John Terry. Some saying dat he is being sacked!! Hurmm.. whatever the reason is... for me it's a really great loss for the Premier League. And I'm quite sure dat this will effect Chelsea's Sunday trip to Old Trafford facing Manchester United.